Bluetooth Speaker with Dazzling Features: The PSYC PRISIM features a simple yet elegant design with dazzling LED light patterns that illuminates your surroundings. Comes complete with wireless Bluetooth technology with built-in lithium-ion battery so you can enjoy a cable free solution for hours. Pre-Programmed Led Options:Liven up your party and mesmerize yourself with the PSYC PRISIM's four pre-programmed light settings using 72 individual LED lights! 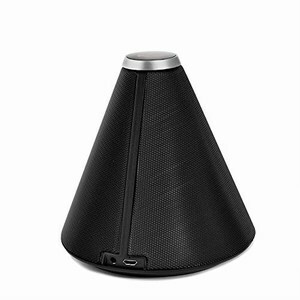 Big sound in a small package:The PSYC PRISIM speaker comes with two high quality drivers that delivers clean and powerful audio with high fidelity can fill your room with energy providing hours of fun.Built in bass technology provides rich and detailed audio, giving your music that extra punch and thrill. Smart design and multiple features:Explore other functions available on the PRISIM speaker, adjust the volume of your tunes by twisting the cap. Play/pause by pressing the cap or to answer incoming phone calls. Haven't got a bluetooth device? No problem, you can use the optional AUX port for direct connection to your source. PSYC Audio and Speakers have a reputation for quality sound with lifelike clarity and detail. Battery life: Up to 12 hours with LED off, up to 6 hours with LED on. (battery life varies depending on use).